Tobe, by Stella Gentry Sharpe, with photos by Charles Farrell. Originally published by UNC Press in 1939. “I saw these photographs and was struck by them. . . . It led to questions: Who are these people? What did they think was going on when these photos were being taken? What happened next, which is always one of my questions. 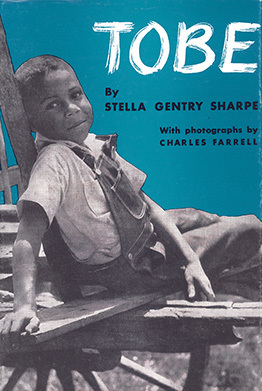 The photos Filene had discovered were some of the 50 photographs used to illustrate Hillsborough schoolteacher Stella Sharpe’s children’s book “Tobe.” The 128-page was book was published by UNC Press in 1939 and explores the life of an African-American family who live on a working farm. Filene will give a talk about the book at 3 p.m. Sunday at the Orange County Historical Museum, 201 N. Churton St. in Hillsborough. What Filene has been able to figure out is that Sharpe and her husband Luther owned a farm on Mountain Creek Road off of Old N.C. 86. A black family of tenant farmers, the McCauleys, lived on the farm. One day Clay McCauley Jr. asked Sharpe why no one in his children’s books looked like him. She responded by writing her first children’s book. “I think one of the interesting things about this book is how rare it was to see a positive depiction of ordinary African American daily lives,” he said. Delving into UNC’s Southern Historical Collection, Filene learned that Charles Farrell had been hired to illustrate Sharpe’s text. For reasons unknown, Farrell went to Goshen, an African American enclave near Greensboro, and photographed two families there, the Garners and the Herbins. So though the text tells of the McCauley family, the photographs are not of them. “One of the really complicated things is that this book is such a mix of documentary, fact, and fiction,” Filene said. If Filene gathers enough material, Brandie Fields, the Orange County Historical Museum’s executive director, would love to exhibit it. The niece of the main character Tobe has learned about Filene’s quest. Read the full article at The Chapel Hill News. If you’re curious to learn more, don’t miss Filene’s talk this Sunday at the Orange County Historical Museum.